The Georgia Department of Natural Resources stocks many small lakes and ponds in North Georgia. 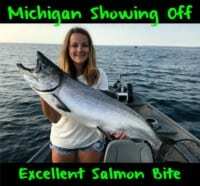 A few of them get hammered by dozens of anglers daily. Meanwhile, that’s not the case at Black Rock Mountain State Park where 17-acre Black Rock Lake rests. The lake is stocked frequently in the spring, and even though it’s only a few miles from Clayton it doesn’t get overfished like nearby Wildcat Creek and the Tallulah River. A ton of rain fell in North Georgia this week swelling nearly every creek and river stocked by the GA DNR. A lot trout that were stocked in recent weeks likely were washed out of the areas anglers normally find them. Meanwhile, the influx of water didn’t affect the trout in Black Rock. 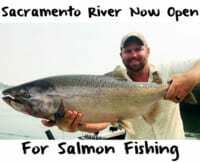 It remains a viable option even as we wait for the rivers to come back into shape. The small lake was stocked last Friday by the GA DNR and will be stocked again soon. Meanwhile, plenty of rainbow trout await anglers soaking bait from the bank. The lake doesn’t harbor large trout, but nine to 10 inch fish and a few to 12 inches are plentiful. Black Rock offers excellent access for anglers of all ages and boasts a fishing bridge and pier, as well as a well-graded trail that circles the lake. It’s a great place to take kids fishing or for those who want to set up a chair and cast only a few feet from their car. The fishing isn’t incredible, but those willing to put in time can catch limits of pan size trout. We filmed Pautzke Outdoors here last week and caught plenty of rainbows in a few short hours. All our bites came off Rainbow, Garlic Salmon Egg, Garlic Wildfire and Peach Garlic Fire Bait. We fished them on a size 10 Eagle Claw hooks and four-pound line. A few things to consider when fishing Black Rock. Trout are stocked near the fishing piers. They’ll stay in this area for a few days before migrating to other parts of the lake. The water is clear. Therefore light line is imperative. Anything heavier than four-pound test is too much. If you’re fishing near the piers you’ll notice it drops off quick. We caught most of our trout within 20 yards of the bank and in the vicinity of the pier. Don’t be surprised if your trout gets eaten by a bass on the way in. We were able to get about a dozen trout to commit to the Fire Bait. On the other hand, after a few five-to-eight-pound bass showed up the trout swam for cover and hid under the piers and docks. There’s some large bass that use many of these trout as growing pills and as soon as the bass show up the trout go off the bite. Editor’s Note: Pautzke Fire Bait is available in most North Georgia Walmart locations and at Bass Pro Shops. 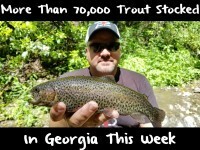 For more info on trout stocking information in Georgia please visit http://www.georgiawildlife.org/Fishing/Trout.